A 50-minute song cycle for 3 performers. Drawing on Japanese folksong and Die Winterreise, composer Juliet Palmer and writer Anna Chatterton have crafted a set of songs exploring the tension between inner reflection and outer journeying. Aki Takahashi, Juliet Palmer and Christine Duncan bridge multiple worlds, singing and playing shamisen, theremin, clarinet and percussion, weaving together shouts, chants and cries with throat singing, opera and gospel. Although worlds apart, this new song cycle finds fresh ground in two powerful yet disparate traditions. 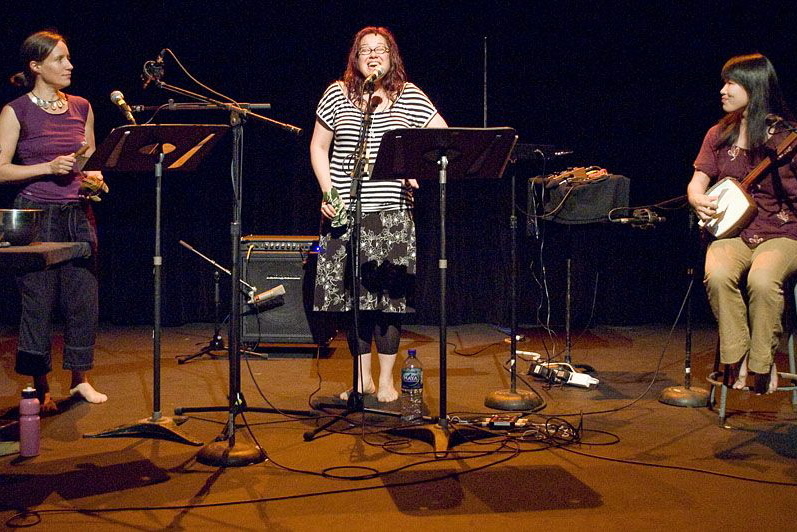 The Province of Impossible was premiered at Open Space Arts’ VOICE++ Festival in Victoria, B.C., May 12, 2007. Performers: Christine Duncan (voice and theremin), Aki Takahashi (voice and shamisen), Juliet Palmer (voice and clarinet). Original compositions and arrangements by Juliet Palmer in collaboration with the performers. English text by Anna Chatterton with additional lyrics in German (Wilhelm Müller) and Japanese (traditional).